Malware refers to any malicious software that is intended to inflict damage to the victim's computer or steal private information from the victim. It includes viruses, worms, Trojans, rootkits, spyware, adware, keyloggers, etc. Most malware programs are designed to disrupt the normal functioning of the victim's computer, steal sensitive data, and gain access to private computer networks. Malware can lead to loss of your hard-earned money, your identity being stolen, or excessive credit card bills. For businesses, it can disrupt the entire IT operations, leading to expensive recovery procedures. It also damages the brand value of the company or organization. Knowing when your computer is infected with malware is as important as knowing how to fix and prevent it. 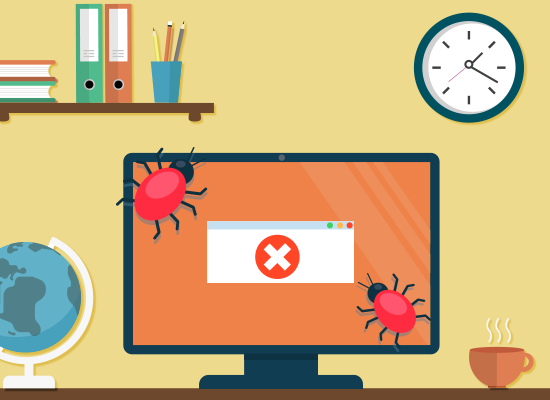 Here are a few telltale signs that indicate your computer is infected with malware. If your computer has malware, you may notice that your system runs slower than usual. Often, it may freeze, hang or become unresponsive and at times, it may even restart by itself. Apart from that, you may see new icons on your desktop or applications that you do not recognize. And, you will not be able to access important system tools such as the control panel, task manager, registry editor or command prompt. If there is malware on your system, you may receive the error "Could not display the page" when trying to access certain websites. Sometimes your web browser freezes, or becomes unresponsive and often the browser's default homepage gets changed. When navigating, you may get redirected to other malicious web pages which display pop-up messages. You'll also notice new unauthorized toolbars on your browser. An obvious malware sign is if your contacts receive an email from you asking them to open an attachment or to click on a malicious link. Install a good antivirus software that provides comprehensive and in-depth protection with an integrated personal firewall and anti-theft. There are many other antivirus products available, but Comodo Antivirus which has all of the advanced features expected in an advanced security product. Since Windows OS is the most popular operating system, most hackers design malware targeted to attack the Windows OS. If you are using it too, make sure to accept regular automatic security updates as soon as they become available from Microsoft. If you are using Microsoft Office Applications, you can also enhance their security by installing patches for them. Malware, especially viruses, can destroy files and corrupt them beyond repair. Always make sure that you create backup copies of your files as they may get corrupted at any time. Practicing good browsing habits like not downloading files from shady websites or clicking links from suspicious or unknown sources can prevent malware infections to some extent. When it comes to an organization, preventing malware attacks needs a completely different strategy. There may be multiple endpoints (computers, mobile device, tablets, etc.) deployed at different locations. For such scenarios, you need an advanced endpoint protection solution that offers all-around protection. Comodo Advanced Endpoint Protection (AEP) is such a solution that provides complete end-to-end protection across the boundary, internal network, and across endpoints preventing even the most advanced malware, both known and unknown.